Christians judging others Christians. And then you point out how Jesus said not to do that, they come up with some excuse like "but that's in the bible, I'm just passing the judgments of god on". I guess you're not as good at reading the bible as you thought you were. What is the context of Jesus' statement in Matthew 7:1? 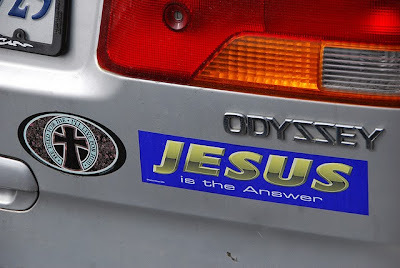 Furthermore how does it relate to His statement in Matthew 18:15ff or Paul's in 1 Corinthians 5:9ff? Finally apply that interpretation and stop judging Lenny for "judging others" because you are breaking the same measure you are setting up. If you try to rebut remember the excuse like "but that's in the bible, I'm just passing the judgments of god on" doesn't work. Surely it would have been more sensible to just ask her directly? e.g. 'Do you believe we are sinners saved by His payment on the cross?' or did you choose not to so that you could write this article? Occasionally the quest for reasoned truth can sound quite cold hearted. Comment threads always become the attacking ground, it should be disabled. There's no point to miss. People when put on the spot by a stranger can reply in a variety of manners, the lack of a substantial answer doesn't necessarily qualify a weak relation with Jesus. Only the lady in question will know the true answer to that, just because someone has a simple concept of faith doesn't mean that others who require deeper reasoning can justify guessing someone core beliefs. Many churches do preach on a lot of 'fluffy' subjects rather than Hell and repentance which I agree needs to be addressed. But this can also be taken to an extreme, I managed to catch a particular preacher on 'End Times' where the guy systematically tore apart a famous American preachers publications practically ridiculing the titles because they were too 'fluffy' or 'Luke warm' as you might like to put. The problem is I think we need the benefit of both facets of God after all with many scriptures such as “It is a fearful thing to fall into the hands of the living God!” (Hebrews 10:31) we know he's not pure loved up marsh mellow! What I got out of the article was the author asking someone what they understood about Christianity and all he received was an affirmation that a life with God at the center was the desired goal. That is awesome and that should indeed be the desired goal. Why? Why are you doing those things? Are you doing them because the preacher preached a message that said that's what we should be doing? Or are you doing them because that's what Jesus died on the cross for? And, honestly (again, this is _my_ understanding), Jesus didn't die on the cross so we could be community servants, He died on the cross so that we could HAVE a relationship with God. God will never be at the center of our lives if we do not first receive His grace and mercy through the blood of Christ. If I had not had a night in 2001 when the Holy Spirit came into me, a night when God invited me into a relationship with Himself - and I accepted - then all the church-going, do-gooding, and relationship building in the universe would leave me exactly where I was before that night: staring into an eternity without God. It's a little chic these days to pooh-pooh the thought of hell as a bad place. Heck, I used to joke about preferring hell over heaven saying, "At least that's where the party will be," or, "That's where all my friends will be." None of us know just exactly what eternity holds, but the Bible - which is all we have of God's plan for us - says that between heaven and hell, heaven alone is where there will be no more tears and no more pain. 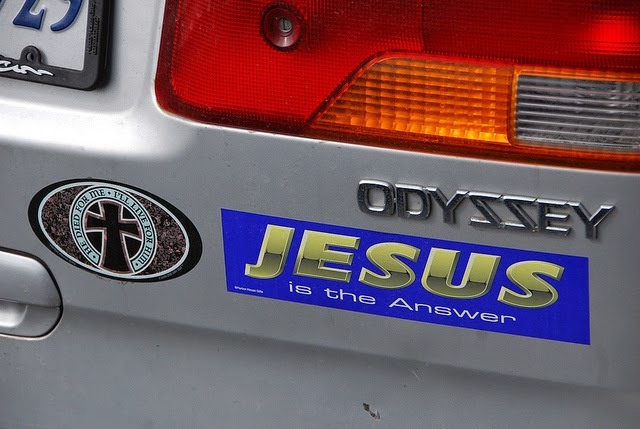 And Jesus Himself said that HE was the ONLY way to get there, whatever and wherever it ends up being. So I think it's a good idea that the author opened up a conversation to help the lady think about all that and examine herself and her faith a little more critically. Her eternal life depends on it. I agree that some churches may be bending over backwards to make folks comfy. However, I just joined a "debate" group on Facebook where every atheist I've heard is pushing this image of God as immoral tyrant ("Make Me believe you love Me or you'll burn forever!"). That seems to have been their take-away from their adolescent experience with church. Lewis said that Christianity has nothing to say to the person who feels that they're just fine the way they are. How do you lovingly preach the disease so folks will stick around to hear about the cure? From the start, the lady has the wrong knowledge what Christianity is. While it is true that you can be saved just by accepting Jesus as your Lord and savior, without religion or church, a religion is still an important aspect for Christians. The lady has a clear issue on following God's commandments which is shown by her rejecting the dreaded religion and choosing the much easier and comfortable 'relationship' with God. This also shows on some 'Christians' today. They prefer the relationship with Jesus rather than the religion because they don't want to follow God's commandments. They will do what they want to do, and still have close relationship with God. It is much easier to be a Christian that way. The lady (and other 'Christians') is doing it their own way. God has His own way. Christianity is mainly about: Accepting Jesus as our Lord and savior because we are sinners and will surely burn in hell. We have to accept that we're sinners and ask for forgiveness and accept that we need Jesus and He's God (not oneness). "Burn in hell", brutal but true. I agree that she has the wrong idea, Ken. My bigger point is neither she Christians who do have the correct knowledge will know of her misunderstanding unless we stop taking the slogans at face value and engage in real conversation.